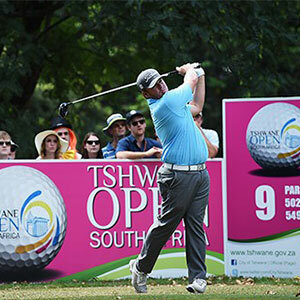 George Coetzee used his aggressive nature and club championship experiences to take his second European Tour title at the Tshwane Open. Coetzee won by a one shot margin from fellow South African Jacques Blaauw, eventually finishing at -14 for the tournament. Coetzee opted to drive the short par-4 17th and was able to get up and down for a the all important birdie to take him one clear. The 28-year old South African claims playing club championships at the Pretoria Country Club worked to his advantage. "I had to draw on my club championship experiences,” Coetzee said. "I threw one club championship away playing conservatively when I was at the 17th. "So today it was quite an easy decision to take out the driver no matter what, because I don't know how to play that hole with an iron." "I think I've finally got the scores down after 18 years of playing golf here. "I know when I'm comfortable hitting drivers and going for par-4's or being aggressive and attacking flags. "I think it played to my advantage - knowing when to be aggressive and when not to." Scotland's Craig Lee, Coetzee's only other challenger on the final day, was unable to close the deficit, eventually slipping to fourth on the leaderboard after carding an even par final round 70. Elsewhere, Robert Rock ended the tournament tied-eighth at seven-under and recently announced Ryder Cup captain Darren Clarke was a further five places back, finishing tied-15th at five-under.